which would you keep/which would you sell? It so happened the seller had and sent a spare (also official) Traycase...the official very one that came with the Limited Edition (signed); of course the Traycase is B_E_A_U_T_I_F_U_L & loads more cool than the slipcase (if anyone is skeptical its an official Long-standing Stephen King Limited edition seller...everything sent is official...he said its "a long story' as to how he had both the Traycase & slipcase...and they both look EXACTLY as the respective Traycase & slipcases look on various online sales on the various editions of this publication. 1. I would like to keep the Traycase as its so much nicer...but do you folks think that's a crazy choice as I would have then a hybrid animal? 2. for whichever one I don't keep, I was thinking of listing it on eBay, at a very low starting price, and see what happens...I do not wish to keep BOTH on my already ridiculously overcrowded shelves...do you folks think either (as-new Traycase or slipcase are 'sell-able'? Re: which would you keep/which would you sell? That's easy. 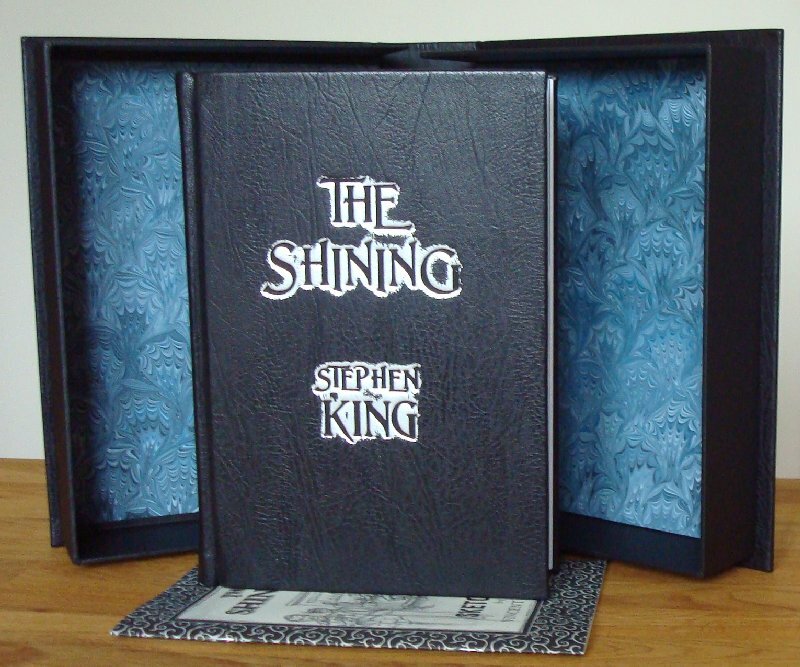 The original slipcase belongs to that book an should stay with it. If you get rid of the original you are devaluing your book. The other S/L case could be sold, although the publisher probably still has some spares. You can't beat real leather though. As a whole, I'd agree - any time you get rid of the official case that came with the book and replace it with something else - suddenly you've got to put a little astrisk next to your item and explain why the item is different from all the rest. Usually this will devalue the item....A similar example is when people replace their worn 1st edition dustjacket with a new looking book club or later printing dust jacket - just kills the value. HOWEVER - in this specific case, you have a relatively inexpensive (compared to the S/L edition) gift edition. You're replacing it with a case that came with the S/L edition. The negative of not having the original case may balance out with having an original case from a higher end edition. So overall the value could be very similar either way. You would however, lower your overall pool of interested buyers as most folks just want the case that came with the book. And if you list you'll have to explain the story of how this change of cases were to come about and whoever buys it would know they'd also need to have this explanation ready when they eventually sell the book, many buyers will shy away from that. A few though, will be willing to overlook it because, like you, they see the book is in an upgraded, official, traycase and that appeals to them. I guess my bottom line here is that I'd probably suggest trying to sell the traycase by itself rather than swap and sell the slipcase - IF you're looking at this strictly from a $$$ position. But if you don't have any near term intent to sell the book and want to swap slipcase for the traycase I don't think you're going to see some massive 50% drop in value by doing this. I can't exactly point to a ton of examples of this happening so take my logic here with a grain of salt. I WANTED the Leather Traycase to be the one to keep, for its obvious cool factor. But the logic of keeping the item as-it-was-meant-to-be is unassailable. Oh well...I almost wish the seller never gave me both case varieties; its a job! Hey Eric, if you'd like to share your remarque feel free to email me with a picture of it and I'll get it posted in the remarques section of the site! I checked the link, and it's weird that these are broken out separately but I'm assuming they mean the lettered edition (base price of $2,500) with an additional remarque (the lettered edition description already states an original remarque). Typical additional surcharge for a remarque via the publisher these days is between $100 - $200 depending on the artist as well as size and complexity of the remarque. I got my Lettered Doctor Sleep with 3 remarques for less than issue price of the book.